We are a leading Manufacturer of upvc pipe 1/2" sch 80, upvc pipe 1.1/2" sch 80, upvc pipe 2" sch 80, upvc pipe 1.1/4" sch 80, upvc pipe 3/4" sch 80 and upvc pipe 1" sch 80 from Jamnagar, India. We are highly experienced firm gaining wide acclamation for the quality of our offered 0.5 Inch UPVC Pipes SCH 80. We have set benchmarking standards by developing the finest range of robust quality pipes that are hot and cold water compatible and ensure hygienic supply of potable water. Widely installed at homes, hotels, hospitals and offices these fire retardant pipes are made from rigid material under strict quality supervision. Further, we stock a wide range of these eco-friendly pipes that can be ordered from us at a nominal price. We are recognized as the industry leaders by developing finest grade 1.5 Inch UPVC Pipes SCH.80 We are providing the premium range of pipes that ensure hygienic water supply. These non toxic pipes are utilized widely at homes and hospitals for potable water distribution hence we make sure to procure the industry compliant grades of UPVC compounds. Further, the industry confirming range of SCH class UPVC pipes is accessible from us in varied wall thickness at a nominal price. We are reckoned as major entity actively engaged in developing high quality 2 Inch UPVC Pipes SCH 80. Our esteemed patrons can avail the industry compliant range of easy to install pipes for both hot and cold water distribution applications. We make sure to procure the premium grade raw materials to develop fire retardant and eco friendly pipes. Further, these pipes undergo strict quality supervision to ensure its SCH class compliant ratings and cost efficiency. We have gathered huge recognizance by developing highly demanded 1.25 Inch UPVC Pipes SCH 80. Our years of industrial expertise can be seen in our offered robust quality pipes that are non toxic and ideal for potable water pipe applications. Owing to the dedicated approach of our team members and modernized R&D facilities we are developing SCH compliant range of pipes from best suited inventory of raw materials. Further, the high quality UPVC pipes can be availed from us in 32mm size at the best price in the industry. 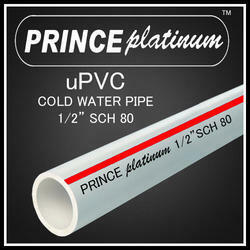 Backed by diligent professionals, we are providing high quality 0.75 Inch UPVC Pipes SCH 80. Our offered pipes are gaining wide acclamation for its superior strength and remarkable physical properties which is ideal for plumbing applications at homes, hotels, high rise buildings and hospitals. These high quality pipes are developed as per set industry standards and demanded widely for its optimum resistance against scale formation. Further, we are providing the quality compliant range in varied sizes and dimensional specifications. We are reckoned as major entity actively engaged in developing high quality 1 Inch UPVC Pipes SCH 80. Our esteemed patrons can avail the industry compliant range of easy to install pipes for both hot and cold water distribution applications. We make sure to procure the premium grade raw materials to develop fire retardant and eco friendly pipes. Further, these pipes undergo strict quality supervision to ensure its SCH class compliant ratings and cost efficiency.